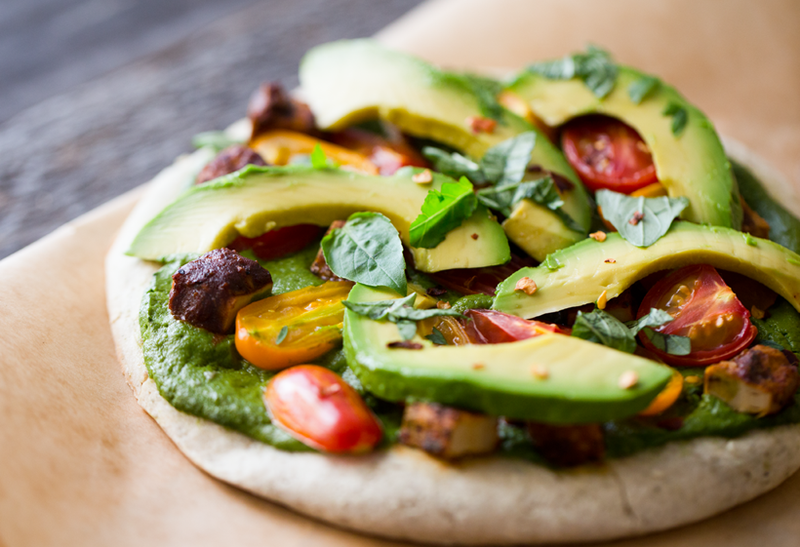 Yummiest Fresh Avocado Pesto Pizza! I still have a giant pile of gorgeous avocados in my fridge thanks to the California Avocado blogpost I did a few weeks ago. Well besides making avocado ice cream (yes, it is yummy as can be) I have been making avocado pesto a lot. I actually came up with this recipe one night when I was exhausted around dinner time (sound familiar!?) and I just wanted to toss some pasta in a pot and have the rest of the meal make itself. I wanted pesto, but simplified. I decided to keep the ingredients very minimal. The pesto sauce I made came out light, super fluffy and oil free. I loooooooooved it. 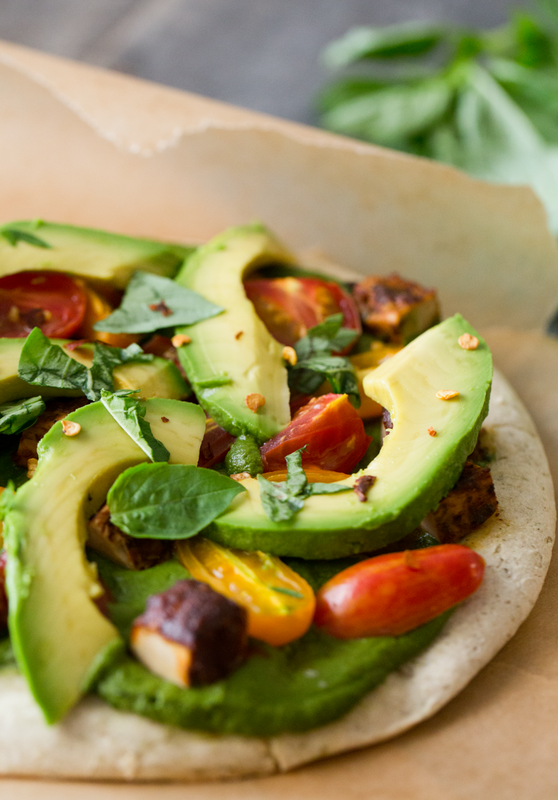 This Avocado Pesto Pizza has BBQ vegan chick'n cubes on top (you could do chickpeas or tofu too..) as well as fresh avocado and basil. 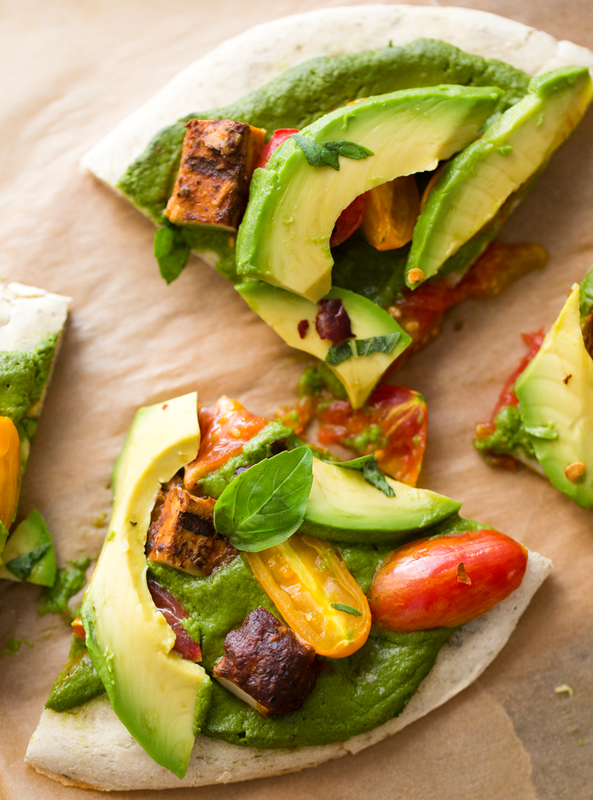 Such a light and lovely cheese-free, super satisfying pizza recipe! Give it a swirl..
Video: watch me make it.. This Pesto. So the first time I made this pesto sauce I actually didn't have any basil. So I literally blended avocado, warm water, raw garlic, a small handful of spinach, salt and apple cider vinegar. Weird right? Well I actually really loved it! 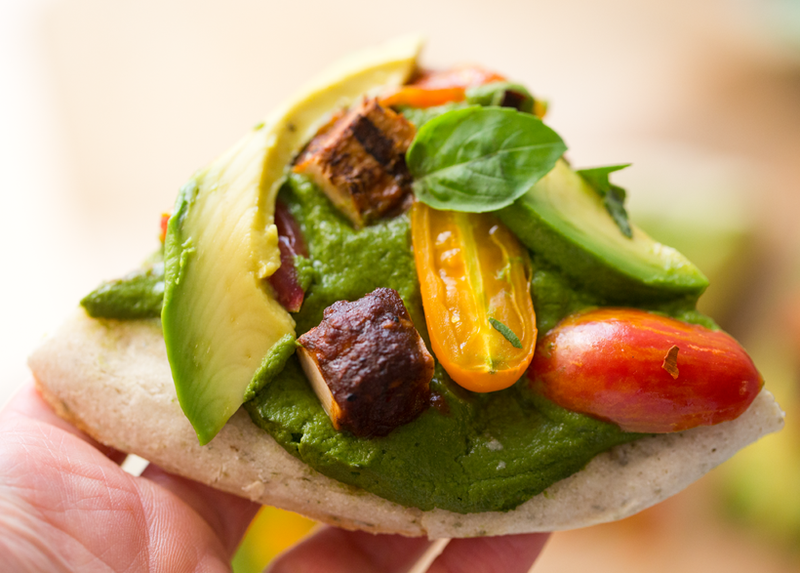 The vinegar and the garlic combined with the blended avocado made this sauce fluffy like a cloud! It had a very zingy flavor from the vinegar, but I actually loved it paired with some black bean pasta. Now, adding the basil, like I did for this recipe, really improves the flavor. But either way, give it a try. 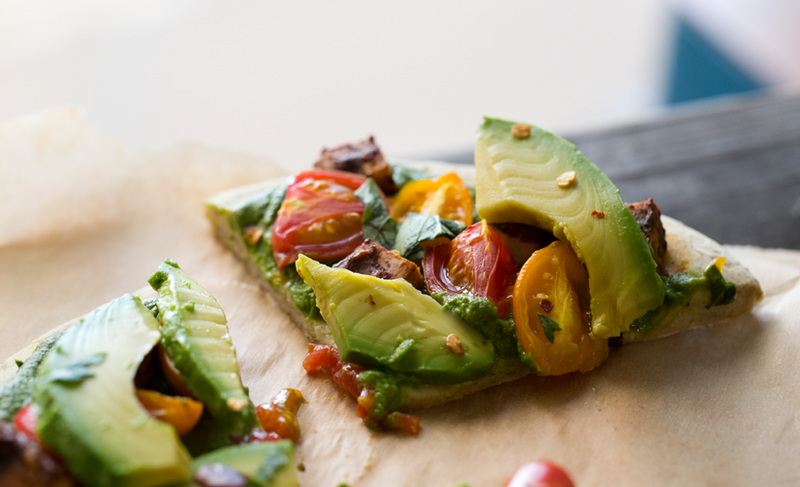 Red sauce pizza is another way to go with the fresh avocado accent..
Fresh avocado on pizza is my summer obsession. 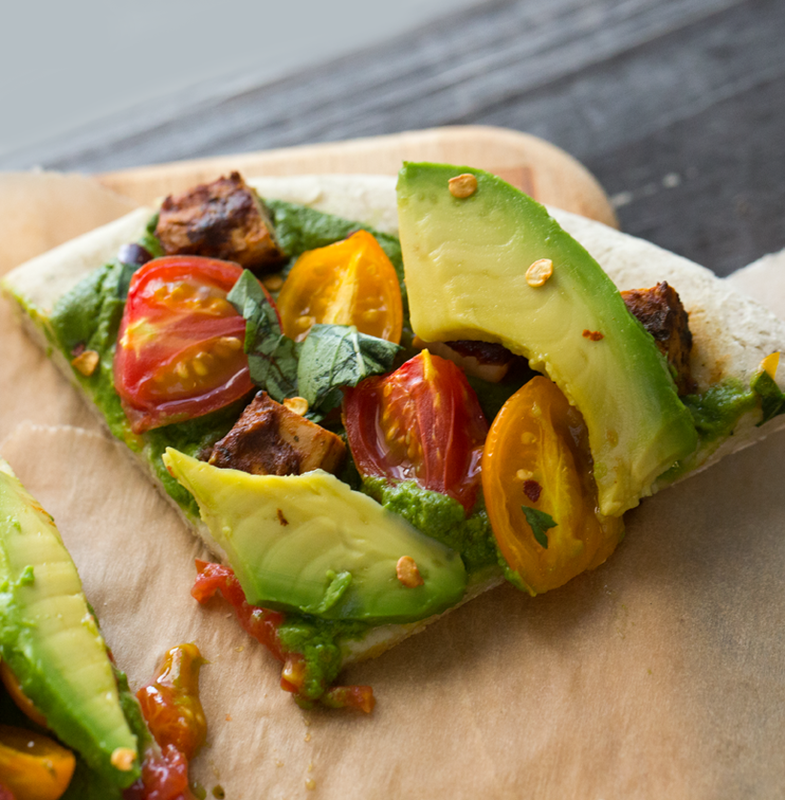 The BBQ and avocado flavors are fabulous, and add in the fragrant-zingy pesto and your pizza dreams come true. 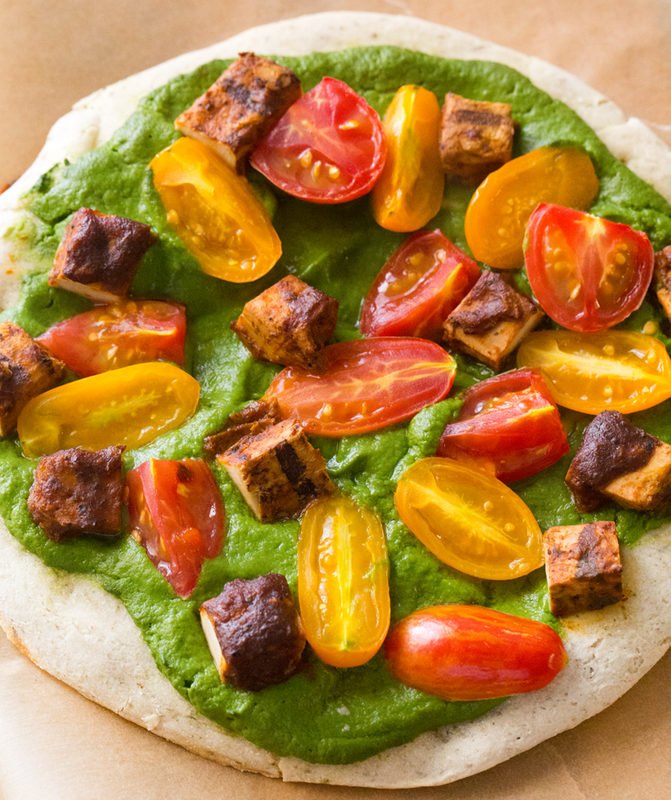 These easy pizzas are made using avocado pesto sauce, fresh tomatoes and some BBQ-infused vegan protein. 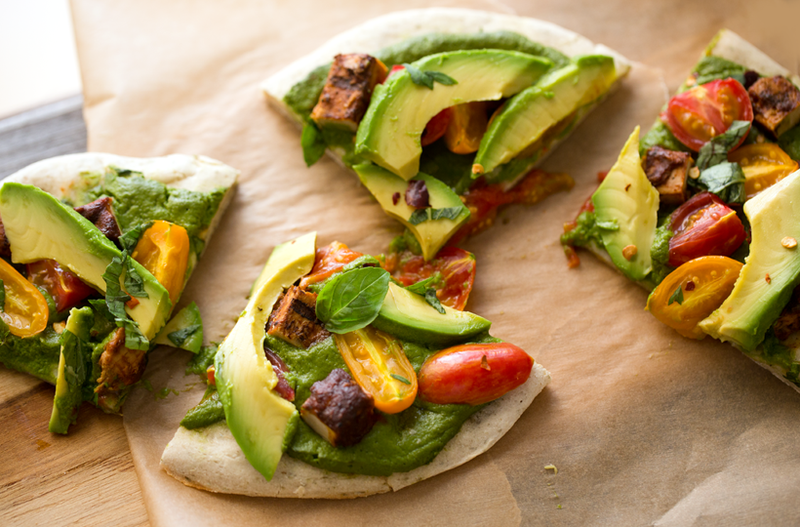 Cheese-free pizzas that satisfy and taste amazing! Preheat oven to 450 degrees. Have a pizza pan or baking sheet ready for use. 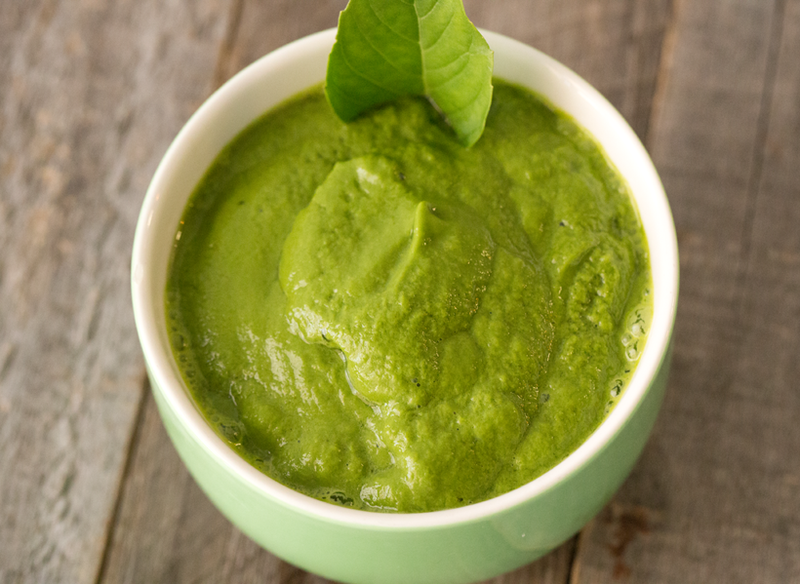 Add all the pesto sauce ingredients to a Vitamix or food processor. Blend until smooth and fluffy. 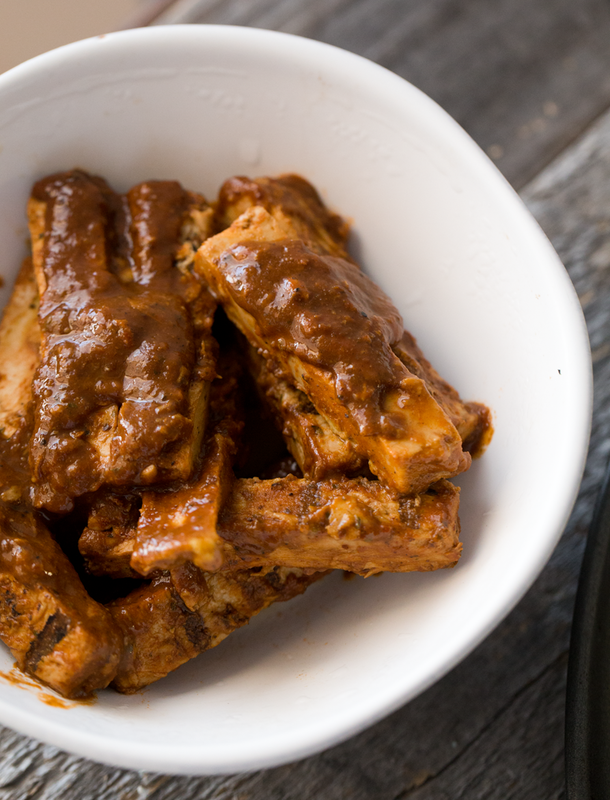 The best part about this sauce is that it blends up very fluffy and light in texture. 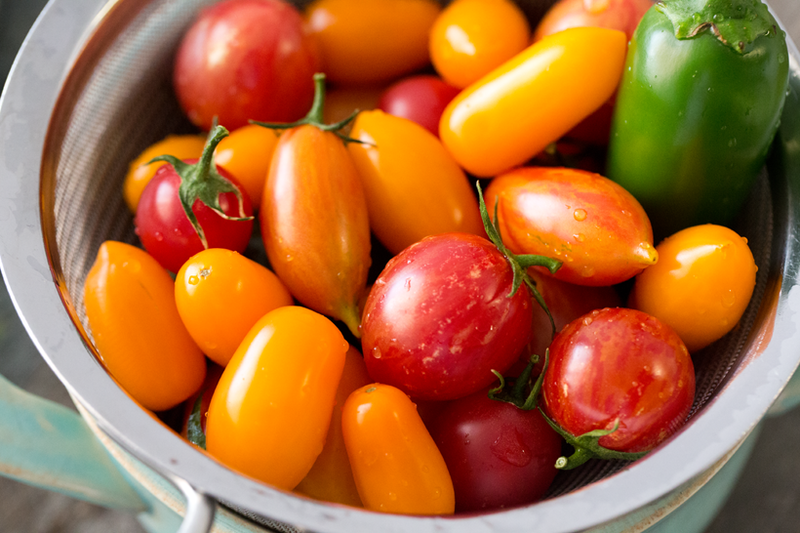 Perfect for a topping and dipping sauce. Pour fresh pesto into side cup. Set aside. Gather all your toppings and assemble pizzas: add the sauce, then tomatoes, and BBQ bits. And any other toppings you crave! Black olives would be delicious on this pizza. Bake at 450 for 10-15 minutes -- this varies greatly based on how large and thick your crust is. And if it is raw dough vs a pre-cooked piece of bread like a pita. When the edges of the pizza start to brown and crisp slightly, then it is done. 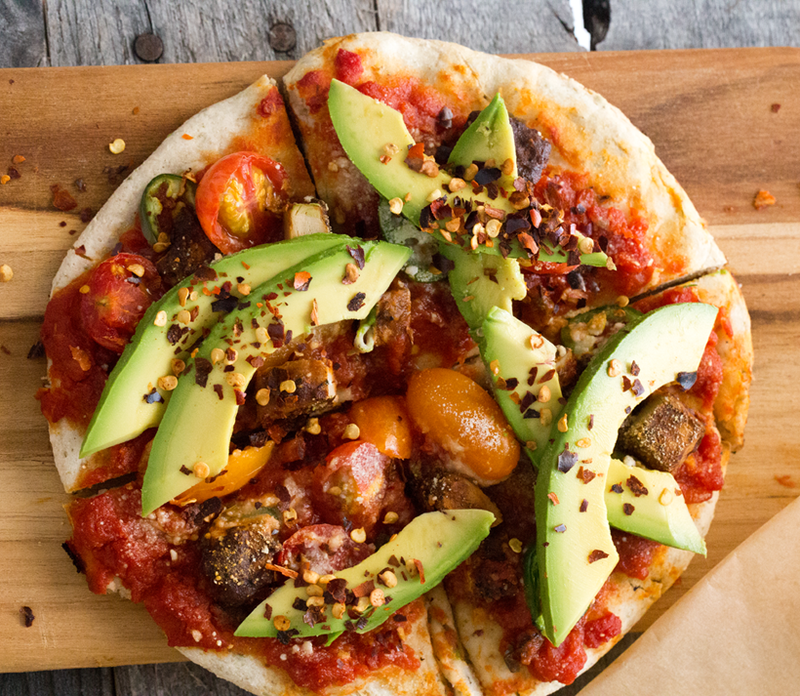 This pizza only needs a few minutes because you are not drastically cooking or even thawing any of the toppings. 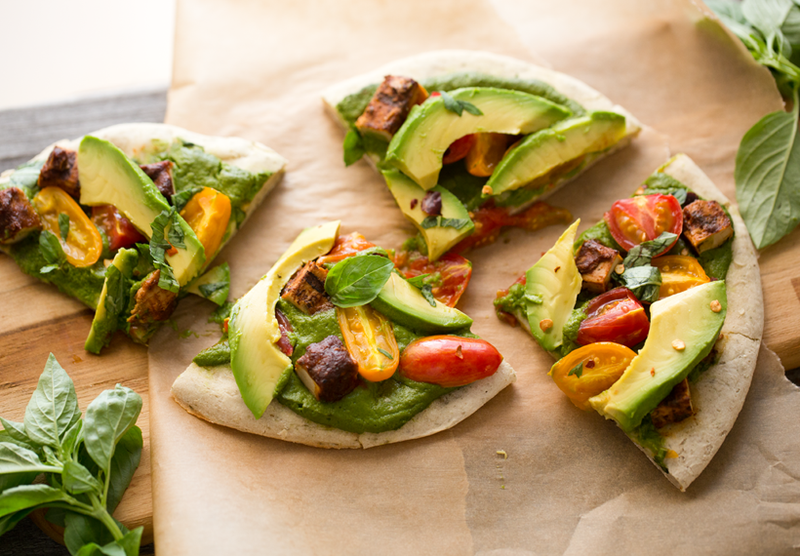 Add the avocado slices, red pepper flakes and fresh basil on top of the cooked pizzas. Slice and serve! I use this sauce as a dipping sauce too once the pizza is cooked! 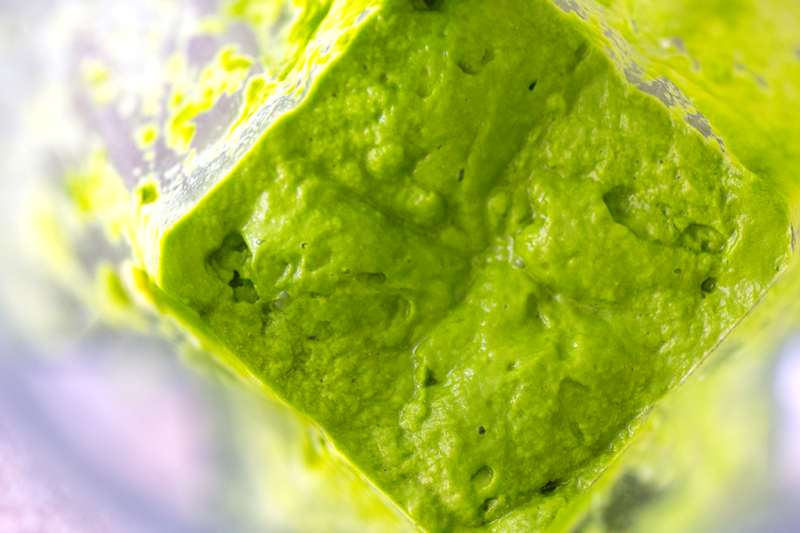 You will have plenty of leftover pesto. Make half a batch if you don't want all the leftovers.